St Louis Cathedral in New Orleans, is it haunted? Were St Louis Cathedral stands, there have been 4 churches, built to serve the spiritual and physical needs of the people of New Orleans. The first structure arose in 1718, a crude wooden structure, a temporary solution for a people really in need of spiritual teaching. The second church was a proper building of brick and timber, which served the people well, from 1727 until it was burned to the ground during the horrible fire of 1788, which destroyed most of the French Quarter. But not to worry, the Spanish built a glorious cathedral, which was finished in 1794, and declared a cathedral in 1793 by Pope Pius. While the two side rounded steeples were in this original building, the central bell tower was commissioned in 1819, designed by well-known architect, Ben Henry Latrobe, who also designed the White House. The bell and original clock came all the way from Paris. By 1849, a larger cathedral was needed for a growing population. During this 1850 ambitious renovation, the central tower collapsed, causing the whole cathedral to be redone, loosing much of the original Spanish architecture. However, the new design was solid and beautiful, creating a house of worship that has endured over 150 years! This solid, beautiful 1850 cathedral was upgraded to a basilica in 1964, by John Paul 11. 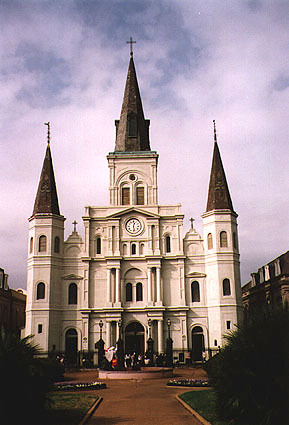 St Louis Cathedral Basilica is considered by many to be one of the most haunted buildings in New Orleans. It has long been the center of spiritual worship of God for the people of New Orleans, and has been blessed with some dedicated people and priests who have served the Lord with fervent dedication in ministry. Story of Pere Dagobert and the slain men. The trouble began in 1764, when the King of France quietly gave the colony of New Orleans and his Louisiana property to the King of Spain in The Treaty of Fountainbleu, neglecting to tell his Creole subjects in New Orleans. Imagine the alarm when the Spaniards arrived in 1766, took down the French flag and replaced it with a Spanish one. thinking that they were being invaded, the people got together, and formed an army, led by 6 prominent, Creole gentlemen. The Spanish at the end of the skirmish left in haste, escaping to Cuba. In 1769, a fleet of 24 Spanish ships carrying battle-ready troops and a fiery new governor of Irish decent, Don Alejandro O'Reily, retook New Orleans. The new governor had his troops chase down the 6 leaders of the rebellion, and shot them without due process of law, leaving their bodies in front of the church. The new governor forbade anyone from moving the bodies for burial, but decreed that they were to be left to rot in front of the church, to teach everyone a lesson. Anyone caught moving the remains would suffer the same fate. This was abhorrent not only to the residents and Pere Dagobert, but also the Spanish, who also were Catholics. The beloved Pere Dagobert visited this arrogant, merciless governor twice, pleading to be allowed to give these men a proper burial. However, the governor refused him both times, and threatened to shoot Pere Dagobert if he came back again to ask for the bodies. Pere Dagobert knew what he had to do, and he wasn't afraid. During a big storm, Pere Dagobert gathered all the families, had the remains put into pine boxes, led a funeral, and sang boldly the mass, in his clear, distinctive voice. He led the procession down to St.Peter's cemetery, singing all the way, where the remains were buried in unmarked graves. No one stopped them. While Pere Dagobert was replaced by the new Spanish monk, Pere Antoine, brought over from Spain in 1769, Dagobert lived until he died of natural causes. He was buried under the main altar. The graves of the 6 men were never marked, and eventually, the cemetery was closed, and other buildings were constructed on top of it. Hopefully an attempt was made to move most the remains, but unmarked graves can't be found easily. Throughout the years, bones have been dug up inadvertently during construction projects. Uh Oh! Pere Antoine started off on the wrong foot in every way, being fresh off the boat from Spain, and determined to establish old world, harsh Catholicism in a new world setting. Known as the Spanish bigot, he caused pain and trouble. He even tried to establish a Holy Court of Inquisition in Louisiana, but luckily failed. All his misdoings and the harm he caused, became a source of great shame, after he underwent a spiritual renewal, that changed his perception of what his ministry should be. Once he found the right path, he focused on his ministry with all his heart and soul. He became a true spiritual leader, prayer warrior, counselor, teacher, and had a vigorous outreach program for the sick, the poor, the imprisoned and the slaves, working tirelessly for their benefit. He ministered to Protestants and Catholics or anyone in need, while living a simple life-style. He died at the age of 81, and was deeply mourned by the whole city of New Orleans. He too is buried in the cathedral, and his portrait hangs in the vestibule, giving everyone a clear picture of what he looked like; A tall, thin man, with dark brown eyes, a flowing white beard, wearing a traditional black monk robe and sandals. Marie Laveau - Her full story can be found on the St Louis Cathedral Cemetery Number 1 story on this website. Marie followed two religions:Catholicism: Worship of Jesus, and Voudou: Worship of the dark powers. She had her bases covered spiritually, or so she thought. Marie was a devout Catholic, and worked with Pere Antoine in his ministry to the poor, and the sick. She helped to nurse yellow fever patients, by the side of Pere Antoine. Despite her good works, displaying her Catholicism, she was denied a marked tomb when she died, because of her other darker activities in her Voudou worship business. A devout Catholic, daughter of a successful baker, she grew up under the influence of the good Pere Antoine. She married a Jewish merchant, Edward Gottchalk, probably against the wishes of her family, and despite Pere Antoine's advise, who also may have had an insight into the young man's character. The marriage turned out to be an unhappy one, as her husband kept a mistress down the street. She had several children. Her youngest daughter, Theresa, died of yellow fever. Her son, Louis Moreau Gottschak who had inherited her musical talent, was a child prodigy in music. His father sent him to Paris at the age of 8, to study with the masters there. He became the first American artist of great acclaim. Anna felt trapped, and depressed, but consoled herself by playing the newly installed cathedral organ, which eased her great remorse temporarily. She fought against her depression the rest of her life, by spending hours in the cathedral-basilica, playing the organ, while her husband continued with his business and mistress, and her children grew up. Ben Henry Latrobe, the designer of the first bell tower, died before his labor of love was finished. His bell tower also collapsed during the revamping of the cathedral in 1849. He was the person sent to Paris to purchase a bell and clock for the original tower. This tower eventually collapsed, and a new one was built in 1849. While the original bell was reinstated, perhaps a newer clock was installed, which seems to be a point of concern for this dedicated soul.